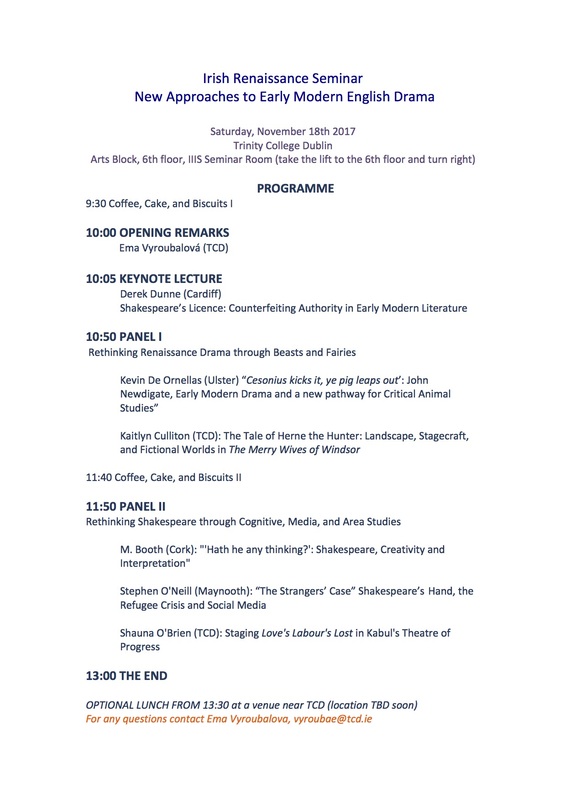 The 20th Meeting of the Irish Renaissance Seminar will be hosted at Maynooth University, Department of English, on Saturday 10th November 2018, in the Iontas Building. 5.15 IRS Discussion / Business meeting, followed by wine reception to mark 20th anniversary. The organisers, Dr Stephen O’Neill and Professor Pat Palmer, acknowledge the support of Maynooth University Conference & Workshop Fund, and Maynooth University Department of English. To express interest in attending, please contact Prof. Marie‐Louise Coolahan (marielouise.coolahan@nuigalway.ie) or Prof. Daniel Carey (daniel.carey@nuigalway.ie). This event is generously sponsored by the Moore Institute for Research in the Humanities and Social Studies, NUI Galway, and the Society for Renaissance Studies. The first meeting of the Irish Renaissance Seminar for 2017 will be held on Saturday 22nd April in the School of English, Drama and Film, University College Dublin. The event is generously supported by the School of English, Drama and Film, UCD, and the Society for Renaissance Studies. The Centre for Early Modern Studies, Limerick, was delighted to welcome delegates and speakers to the autumn meeting of the Irish Renaissance Seminar, held for the first time at the University of Limerick. We gathered on a beautiful, crisp Saturday in UL’s Kemmy Business School for an afternoon of papers on the theme “Early Modern Otherness: Outlaws, Exiles, Outsiders”. Our three-paper panel session opened at 1pm with Dr Clodagh Tait, a lecturer in the History Department at Mary Immaculate College, Limerick and a member of the executive committee of the Limerick Centre for Early Modern Studies. Clodagh’s paper, entitled “Outlawed Emotions: Lordly Rage and its Consequences in Early Modern Ireland”, was concerned with what the State Papers can tell us about the language around reports of emotional outbursts, cursing, oaths, and verbal violence, in particular focusing on Turlough Luineach, seemingly renowned for overawing others through rage and violent language. She argued that our sense of an idealised Irish lord, an impression formed from the honour values associated with that community and the praise-poetry composed for them, might in fact be challenged by this evidence, which seems to have more to do with emotional responses in a predominantly “face-to-face society”. The Gaelic lords and the peculiar nuances of Bardic poetry were the subject of the second paper in this panel. Dr Gordon Ó Riain’s paper “A Fifteenth-Century Ulster Poet in Exile”, traced the fortunes of Conchubar, a poet exiled by his patron ÉinrÍ (one of the O’Neill of TÍr Eoghain). From his uncertain position as an outcast in Connacht, the poet composed a poem that includes a warning of an impending full satire; this warning found formal expression in the poem in a tréfocal, and its inclusion augments the kind of praise offered by the poet in this context. Finally in this session Evan Bourke, a PhD researcher with the RECIRC Project, NUIG, presented a paper entitled “The ‘Burden[some] Sister’: The Reception and Representation of Jean Appelius (nee Dury) in the Hartlib Circle, 1641-1661”, showcasing research on letters that evidence the social exclusion suffered by Jean Appellius, sister to John Dury, that can be found in letters written by Dorothy Moore, her sister-in-law. Though no letters written by Jean are extant, Moore’s letters to members of the circle show that Jean was a problematic figure in the Dury circle: she was considered to be less than pious, and described in very strong terms in correspondence. Bourke’s contention was that the letters evidence a project of ‘othering’ within a close network, containing very great detail about Jean but also a very strong dismissal of her. After tea we were treated to a plenary lecture by Dr Ruth Ahnert. Ruth, a senior lecturer in Renaissance Studies at Queen Mary University of London and a co-director (with Prof Joad Raymond) of the Centre for Early Modern Mapping News and Networks, is currently conducting research on Tudor Networks of Power, in which she combines digital methods from the field of Complex Networks to study Tudor letters from the State Papers. Ruth’s fascinating lecture, entitled “Conspiracy and Surveillance in Tudor England”, demonstrated how Complex Network analysis can be incredibly revealing for Tudor letters, exploiting and studying similar aspects such as nodes, hubs and edges to reveal similar underlying patters and real-world networks. Ruth showed us in great detail how this kind of collaboration (undertaken with her husband Sebastian Ahnert) can uncover all sorts of activity and connections between suspected spies, conspirators and double-agents that would not ordinarily be discernible in traditional approaches to this sort of archive. One of the case-studies used here were the letters of Edward Courtenay, Earl of Devon and the great-grandson of Edward VI, who was a prisoner in London and was exiled to Venice in the 1550s. Ruth’s evidence uncovered an anomaly (an unusual burst of activity) around him. All but one of his letters preserved in the State Papers was sent from exile, and a high proportion of them were intercepted. Courtenay knew he was under surveillance, but he persists in writing to dubious individuals. After a day of wonderful papers we adjourned to the nearby Castletroy Park Hotel for an early dinner and a very jolly time. We heartily recommend the fish and chips! This meeting of the Irish Renaissance Seminar was sponsored by the faculty of Arts, Humanities and Social Sciences, UL; The School of Culture and Communication, UL; and the Society for Renaissance Studies. A sincere thanks to delegates who travelled to be with us on the day, and in particular huge gratitude to our four splendid speakers. We look forward to reconvening in the springtime at UCD for the first Irish Renaissance Seminar meeting of 2017! Guest post by Dr Carrie Griffin, Lecturer in Early Modern English Literature in the School of Culture & Communication at University Limerick. The Centre for Early Modern Studies Limerick is pleased to announce that it will host the Irish Renaissance Seminar in November. This will be the first time that the IRS, held biannually in universities around the island of Ireland, will take place in Limerick. The CEMS Limerick, launched last week, is a joint initiative between scholars at UL and MICL. “Outlawed Emotions: Lordly Rage and its Consequences in Early Modern Ireland”. “A Fifteenth-­Century Ulster Poet in Exile”. “The ‘Burden[some] Sister’: The Reception and Representation of Jean Appelius (nee Dury) in the Hartlib Circle, 1641-­1661″. This event is generously supported by the Faculty of Arts, Humanities and Social Sciences, UL, the School of Culture and Communication, UL, and by the Society for Renaissance Studies. For further details on this event, please email Dr Carrie Griffin (Lecturer in Early Modern English Literature, School of Culture & Communication, University Limerick).